“Hey, I just followed you on Twitter!” My heart just skipped a beat when my Mom said that. At the age of 75, no one would believe that she’s into social media, surfing the Internet, and being part of the online revolution. Unfortunately, some people still see seniors as second-class citizens of our digital society. Yes, technology can be overwhelming since its developing at near breakneck speed. But, it doesn’t mean they can’t be as tech-savvy as we are, right? 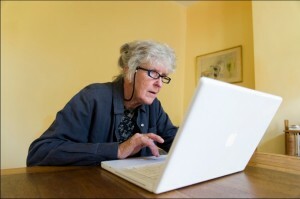 For the past five years, over half of senior citizens in the United States used the Internet. 77% of these “Silver Surfers” are aged between 50 to 64 years old, while 53% of them are aged 65 and above. Since my mom is slowly becoming a silver surfer herself, she’s beginning to see the benefits of technology. Just like most senior netizens, she usually goes online for about 4 hours a day to check her email, read the news, and log into her social media account. About 90% of the elderly use Facebook, 17% are on Twitter, and 14% are updating their LinkedIn Profiles. “Why haven’t you updated your profile?” that’s what she would usually tell me. For her, your virtual profile should reflect who you are in real life. “How can they trust you, if they don’t know who you really are?” That’s what she would usually tell me. Anja Leist, a psychologist and researcher at the University of Luxemburg said in an interview that “there are many online forums where people in difficult life situations, such as informal caregivers of a spouse with dementia or individuals with depression, can exchange thoughts as well as receive and provide social support.” Being an empty-nester, I can understand my mother’s need to connect with people. Not just with her friends, but most importantly, with her family. Since we’ve all moved out and established our own families, social media is the only place where she can get updates about us. Once in a while, she would comment on our tweets, status messages, or even poke us on Facebook. Basically, it’s the best place to keep in touch with everyone. “At, first I was really afraid, but now I’m not.” These were the first words she told me when first used a computer. Most people her age would frown at her “tech-savvy lifestyle”. But for her, life is about learning, until you breathe your last. “I saw the dawn of these things [technology], and it will be a waste if I don’t try them out,” my mother said. As she bid me good-bye, I realized that we are no different than her. We created this digital divide at the risk of shutting them out completely. It’s time that we do them a great service, by teaching them how to use these new technologies at the twilight of their lives. Allie Cooper is a tech enthusiast. Music lover. Blogger. She keeps tabs on the latest social media updates, new gadget releases from Verizonwireless and chic fashion trends. Follow her on Twitter.